"Wow." That is my initial impression of the Fast Lane 1/14th scale RC Rock Crawler. Its appearance is amazing. Its design is practically pro-grade. It features a mid-mounted motor and transmission, telescoping driveshafts powering locked solid axles, a steering mechanism that moves with the front axle, a pro-style "4-link" suspension arrangement, and soft springs to allow a fair amount of suspension flex. The tires are soft and feature a realistic tread pattern. 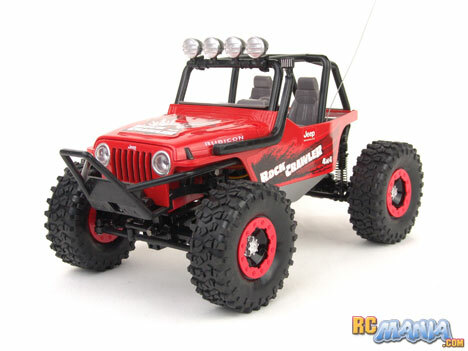 The body features realistic details, including a front skid bar and slanted side rock guards. While looking at the sides, you quickly locate an easy-to-operate high/low gear ratio selector, which allows you to drive at one speed over gentle terrain, and gear down for slower, more precise movement with more torque when attacking rocks and exceedingly rough dirt. The headlights work (though the roof lights do not). It features proportional throttle with multiple forward speeds depending upon how far you squeeze the trigger on the pistol-grip controller. The only bad thing I noticed is that the wheels do not seem to be attached very securely. They don't seem like they're at risk of coming off, but you gan grab any one of them in your hand and twist it around quite a lot, as if there's a ball joint in the wheel hub. The rears are worse than the fronts in this regard. I wanted to try tightening them up on my own, but the nuts or screws that hold the wheels on are hidden away behind realistic hub covers that are actually securely glued on, preventing access. I started my test runs on pretty flat ground with just small bumps, and I had the Fast Lane Jeep in high gear. The speed was pretty low, but not to the point of being boring. It was about what you'd expect from a highly lifted Jeep travelling on dirt. However, steering was a problem. It would turn to the right pretty well, but to the left its turning radius was really large. Though the vehicle has proportional throttle, steering is on/off, so you're supposed to get full steering both ways at al times. More disturbing than that, when I would let go of the steering wheel on the controller and let it center itself, the wheels on the car would often start turning left and then right in a fast alternating cycle, like it wanted to keep them centered, but couldn't figure out where center was. You'll see this clearly in the video. Next I shifted the transmission into low gear and went to progressively rougher terrain. I was very impressed with the vehicle's true off-roading and crawling capabilities. It get over some pretty large obstacles and just keep going. Even when I would get stuck, most of the time I could back it out and get it unstuck without taking my hands off the controller. The suspension works really well and the stars of the show are the tall, soft tires, which have a level of grip that surpass anything I've felt on toy-class RCs before. The steering problem, though, actually got a little worse the more I drove, with the wheels frequently wagging back & forth like they had a mind of their own, and left turns becoming slower & wider all of the time, to the point where I basically had to go briefly backwards while steering to the right, in order to make the vehicle face to the left. Ah, so close! The Fast Lane 1/14th scale Jeep Wrangler Rock Crawler had great potential and very nearly delivered on it, but the "Achilles heel" is the steering, which hampers the performance and driving experience. What was surprising to me was that even with the mechanical troubles, I still had fun inching the vehicle over rocks & big dirt clods. For the "hobby grade" folks who read this, the picture is a bit more rosey. Folks more mechanically-inclined can simply install a cheap, small proportional "servo" (steering actuator), and a spare radio and very low-end speed controller to completely solve the steering issue (and perhaps free up the front suspension to flex even more than stock). The wheels can be better secured by popping off the hub caps, removing the wheels, and wrapping the small hex-shaped end of the drive axles with a thin strip of thick tape to reduce the amount of free play around the sides. Experienced hobbyists often have the necessary parts lying around as spares, and with these modifications, the vehicle suddenly reaches much more than its original potential. In box stock form, though, the Fast Lane 1/14th scale Jeep Wrangler Rock Crawler could have been an A+, but the significant steering issues knock it down to a barely passing grade.